Reiki is an ancient healing practice. It is believed to have originated in Tibet and was ‘re-discovered’ in Japan. William Lee Rand describes Reiki as “a Japanese form of stress reduction and relaxation that also promotes healing.” It is a laying on of hands system of healing that promotes deep relaxation and brings the body back into balance. It is not a belief system nor is it a religion. 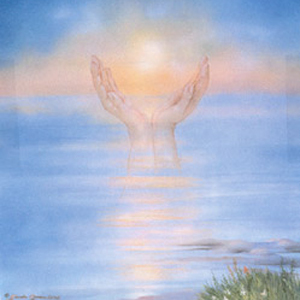 Reiki is Divinely guided life force energy that flows from the hands of the practitioner into the client. This energy flows into all aspects of the client’s body, mind, emotions and spirit to bring healing. It adjusts itself according to the needs of the client and is a safe and gentle practice. Monica, as a Reiki Master, channels this energy for healing and teaches, attunes and initiates others at all Reiki levels, having been attuned and initiated at the 3rd degree level of Usui Reiki. Monica also combines her knowledge of Healing with Angels with her practice of Reiki. Although Reiki has a multitude of benefits on all levels and can help unblock problem areas and clear chakras and is useful for illnesses and injuries it is not a replacement for conventionall medicine. A Reiki session is given in a quiet, meditative and safe environment using a comfortable and special massage table. The client is fully clothed and each session begins with Monica mentally saying her own prayer for her client and herself. Most sessions last an hour to an hour and a half depending upon the client’s needs.